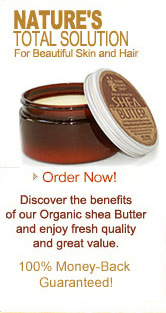 Shea Butter is from the nut of the Shea Tree, also known as "The Tree of Life". The Shea Tree only grows in the savannah region of Africa. It grows up to 60 feet, can live up to 200 years, and produces its fruits once a year. The nut in the center of the fruit when crushed and traditionally processed by boiling to extract the oil is what yields the vegetable fat known as Shea Butter. Shea butter has been used for centuries in Africa for cooking, and also as skin treatment for its amazing ability to renew, repair and protect the skin against harsh climates. Unrefined Shea Butter is traditional shea butter in its raw and all natural state, with no additives. It has a soft texture, ivory to yellowish beige color, and has a mild nutty scent which fades away within minutes once applied to skin or hair. Unrefined shea butter is the most effective type of shea butter because the healing and moisturizing properties are intact, undiluted and unaltered. This is the only type of shea butter we carry. 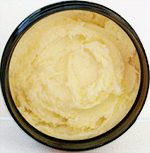 Refined shea butter is altered to remove the natural shea scent and color. In the process, most of the effective properties are also lost. Highly Refined shea butter is extracted with chemical solvents like hexane. The extracted oil is then refined which involves bleaching, deodorizing and overheating it. As a result refined shea butter is bleach white in color and odorless, but it lacks the true moisturizing, healing and therapeutic properties of traditional shea butter. Some people buy refined shea butter because it doesn't have the natural shea scent, but they don't know it has reduced beneficial properties. Many major cosmetic companies have started making shea butter products including moisturizers, anti-aging, stretch marks and hair products. These products also fall under the category of processed shea butter because the percentage of shea butter in these products is very low and not so effective. 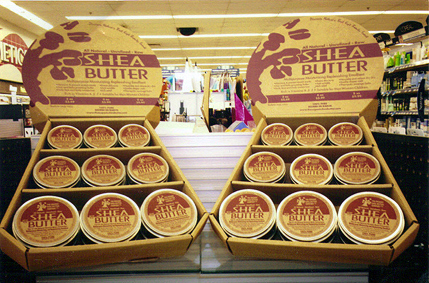 The shelf life of shea butter is 18-24 months. After that time the healing properties of shea butter are less effective but it is still a good moisturizer. 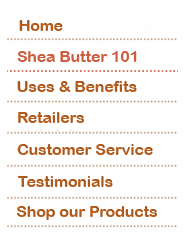 Store shea butter in a cool dry place, away from direct heat and sunlight. Shea butter is the best natural product to protect, heal and improve skin. It is prized because it contains a real cocktail of elements good for the skin. Among these, is first a very high content of unsaponifiables and Essential Fatty Acids. These fatty acids are oleic acid, stearic acic, linoleic acid, and palmitic acic. They play a very important moisturizing, softening, and anti-inflammatory role, and help renew the cutaneous cells. Shea butter also contains vitamins A & E that have a recognized effect against skin aging. It is also rich in phytonutrients with protecting and regenerating virtues. Note: the manufacturing process has a great influence on the properties and efficiency of shea butter. If Shea Butter is refined or processed, it loses its vitamins and part of its efficiency. The Organic Shea Butter Company brings you a handmade Organic Shea Butter that is a guarantee of purity and higher quality.